Welcome to NS Math Circles! Nova Scotia Math Circles is dedicated to enriching the experiences of Nova Scotia student in all areas of mathematics. Our program vision is to foster enthusiasm for math through interactive, creative, and meaningful presentations. We offer monthly events at Dalhousie for senior high and advanced junior high students, and visit schools all across the province for free. Cryptography is the study of protecting, coding, storing and transmitting information and messages so that only those who are intended to may read it. In other words, it is the study of secret messages and codes. Encryption is the conversion of messages to the secret code, called ciphertext. In order to read the information normally, one must decrypt the ciphertext, converting it back into plaintext. In this talk, we will look at some different types of cryptography that are used. Pizza and pop will be served. To register for this event, send an email to mathcircles@dal.ca. Want to receive email updates and reminders for our monthly events? Sign up for our mailing list on the left! To read our 2017-2018 Annual Report, click here! Thank you Eastlink for a Half-Million Dollar Donation!!! On June 17th, 2014 we announced a partnership with Eastlink. 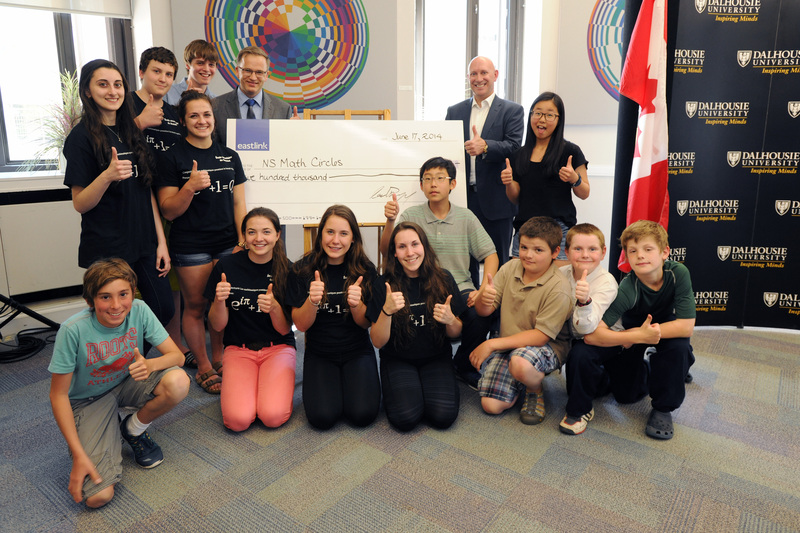 They are donating $500,000 to NS Math Circles over the next 5 years! We will now be able to further expand our outreach into junior high schools and begin outreach in the elementary schools. Thank You to Lee Bragg and Eastlink for this generous donation! Click here for the article in Dal News on the event! Check out an article about NS Math Circles in the Community Herald! Contact us for ideas on how we can best serve your needs. We would love to coordinate with you and give a presentation to your school for FREE!